Yonder is 60in x 84in. 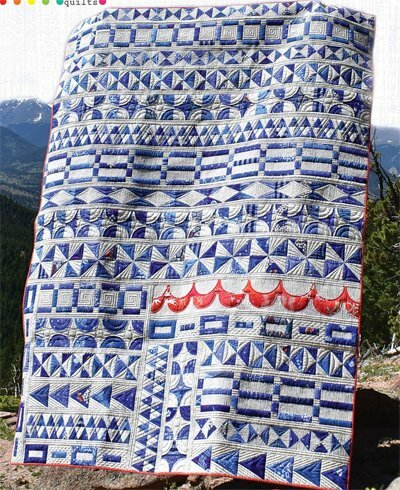 Let's go with the classics: you can never go wrong with blue and white or a sampler quilt. Yonder is both. And the pop of tomato red or orange (we can never agree) gives it an extra pop. The block of the month friendly set up is a row-quilt sampler of basic units, and some not-so-basic units, that keep your attention. The Tri-Recs Rulers, are extremely helpful, but not required, in cutting out your template pieces and Yonder templates are available for the curved piecing. The pattern is 29 pages plus three template page and one coloring page.